We are so excited to bring you a preview of Rasputin’s Legacy set to be released on the 28th of July! But don’t wait for the release? Pre-order and get FOUR Bonus Prizes! The Cold War. A backdrop for betrayal. A playground for power. A rogue Soviet general mobilizes to overthrow the Soviet regime and gain control of the USSR’s military arsenal. The world is on the brink of war. To stop him, the US president sends covert operator Atcho deep inside Siberia. Failure could spell annihilation – and a relentless investigative reporter pursues him, certain that Atcho is the shooter in an assassination attempt. Worse yet, Atcho’s beautiful fiancée, a former CIA operative, goes rogue to save him. Don’t miss this nail biter that Carmine Zozzora, producer of Die Hard with a Vengeance calls “pure gold.”. They don’t write books like this anymore, and though it took an agonizing wait of 3 years for me, it all paid off! I savored every word, as Lee Jackson’s meticulous research, well developed plot, realistic characters, exact locations and plausible events took hold of me. Though this work of art is pure Historical fiction, Lee Jackson executed his story so well, it was hard to distinguish fiction from fact. Far from being just Histfic, the plot lines flowed effortlessly from one action packed scene into another, with ample twists, nerve wrecking suspense, intrigue and rich dialogue. One of the few books in my opinion that not only served as entertainment, but it was thought provoking and educational too. When the last page is turned you are left with a jaw-dropping ending and yet Lee Jackson left room for book three in the series too. The best part is that you don’t have to read Book 1 in the Cold War Series to enjoy this book, but you wouldn’t want to miss out on a beautiful father/ daughter story, now would you? <span style=”font-size: 12pt;”So go on and splurge on an electrifying action packed emotional journey about a man who has to save the very country that betrayed him, all whilst staying one step ahead of his stubborn girlfriend and a relentless reporter. Burly thrust his hands deep into his pockets. “That’s right. You never spoke to either of them. They will both disavow you.” He studied Atcho’s face as if to discern whether he fully understood. Burly seemed reluctant to go into depth. “C’mon,” Atcho urged. Burly arched his eyebrows. He sat back as if reluctant to proceed. As he spoke, visions swirled in his head, of unspeakably small torture boxes in dank, dark dungeons; of an impossible escape attempt under the unforgiving glare of an accursed full moon; of coerced training in a non-existent camp outside of Moscow; of years lost while separated from his beloved daughter. Would I risk that again? “Yeah.” Burly was somber. He reached into his pocket, pulled out several small objects, and held them in his open palm. “The cops think it was a burglary, but my guys did a sweep of your apartment. Atcho stared at the listening devices. “So, someone is already on to this mission,” he said slowly. THAT”S RIGHT!!! Pre-Order purchasers will receive these 4 BONUSES FREE! email a copy of your purchase receipt to GetDigitalCurseTheMoon@gmail.com. You’ll receive back all the bonuses in eBook form. If you would like your book autographed, tell us that in your email. We’ll provide back an address to which to send your copy. When sending, be sure to include pre-paid shipment materials to send the autographed book back to you. 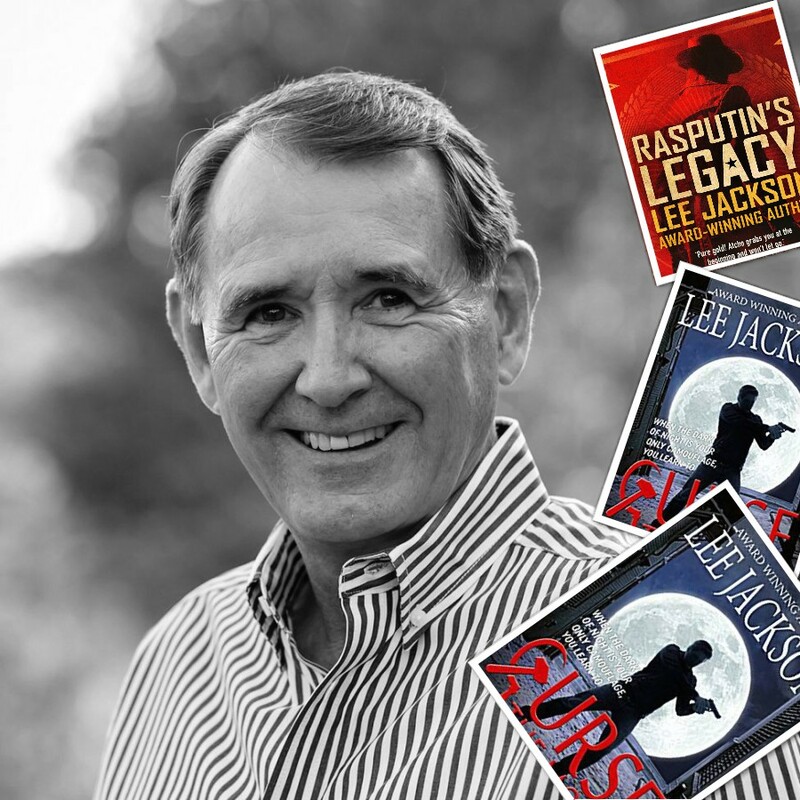 Lee Jackson is a bestselling, award-winning thriller author. He was an Infantry officer with a front row seat on world affairs, and spent 38 months in Iraq and Afghanistan. Book 1 of his Cold War Series, Curse The Moon was published in 5 countries. Book 2, Rasputin’s Legacy, is due to go on pre-order on June 28, and will be fully released by July 28. Curse The Moon follows Atcho, a counter-revolutionary leader in Cuba turned unwilling spy in the U.S. The odds he faces seem overwhelming as he must choose between saving the world from nuclear holocaust – or his daughter. In Rasputin’s Legacy, he faces a surreal challenge: he must save the country that enslaved his own, or deliver control his personal desire for revenge? Lee Jackson lives and works with his wife in Texas. The Cold War. A backdrop to betrayal. A playground to power. When his daughter is kidnapped, Cuban-born, West Point Graduate Atcho must be a sleeper agent to men he’d rather kill. Atcho’s rise opens doors into US National Defense even as a seemingly omniscient KGB officer holds unflinching sway over his actions. His public life clashes with secrets that only he and his tormentor share, isolating him in a world of intrigue among people whom he is determined not to betray. His choice: save his daughter, or save he world from nuclear holocaust.When the darkness of night is your only camouflage, you learn to Curse the Moon. Get your copy here now. 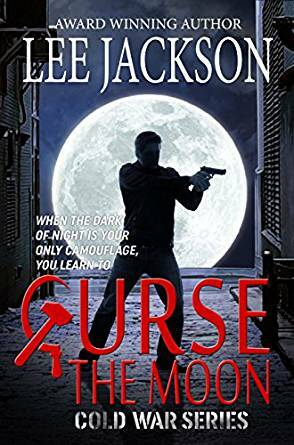 Curse The Moon is the first book in Lee Jackson’s Cold War Series. 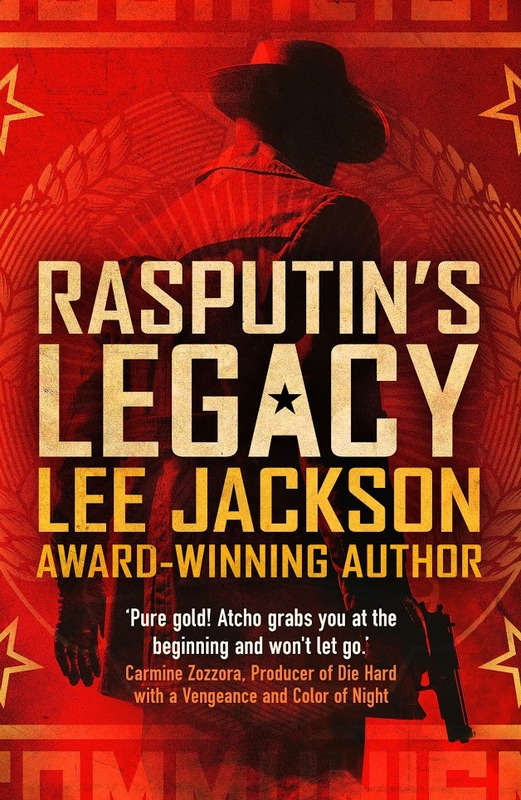 The sequel, Rasputin’s Legacy, will be released in late-April 2017.In the tradition of Robert Ludlum’s page-turner, The Bourne Identity, Atcho fights against overwhelming odds, bleeds when hurt, and won’t back down. Think: Jason Bourne meets Dr. Zhivago. To experience the violent intrigue of Cold War Cuba and Russia vs. the United States, get Curse The Moon today. Atcho is known by many names but his only goal is to find his daughter who was kidnapped by a Russian General called Govorov. All he wants to do is find her and flee to the US where he was a former student at West Point when he was younger. His friend Juan convinces him to go to a secret meeting with members of the CIA who wanted their help to rise up against Castro and might help him find her. In a cruel twist of fate, just as he hears of her release, he is thrown into the middle of the Cuban Revolution where actual events are true and based on fact. He leads the revolutionaries through the battle of the Bay of Pigs, but things don’t go as planned and he gets caught where he spends fourteen years in the Boniato prison. He is sent to the Isle of Pines prison for another five years. He goes from planning and training men for revolution to planning and training men to escape out of prison. Though, he did not escape it was not in vain as years later one of the prisoners he helped escape is responsible for his release. Just when he reunites with his daughter, who’s own story is gripping, he finds himself working for the very same General Govorov and the Soviet Union to once again keep his daughter save. Curse The Moon is an action packed, deeply moving story about a man’s desperate struggle to reunite with his daughter amid political, social and personal change. It grips the reader from the starts as depicted in this excerpt from the first paragraph: ‘Atcho slouched against a wall, alone in a small plaza illuminated by the dim yellow light of a single streetlamp. His eyes probed the surrounding darkness. His fine, aristocratic features were hidden behind a week’s growth of unkempt beard, while his normally well-groomed hair fell in shaggy brown locks below his ears. Since state Security Police, commonly referred to as G-2, had never seen Atcho, at least not as himself, they knew him only by reputation. Tonight, they would be looking for his messenger. Atcho’s ears strained for the sounds of approach. His powerful frame ached to be released from its tense stance. “For Isabel,” he muttered. “From there, the mystery and intrigue incorporated into this action packed book by the ever present General Govorov in Atcho’s life ensures that the pages turn themselves! Thank you for being a Legendary tour host and posting about Rasputin’s Legacy on your awesome blog!